Woo Commerce is a very powerful shopping cart plugin. This tutorial covers the basics for adding a simple product. If Artbiz set up Woo Commerce for you then most of the configurations have been set. You will need to decide on how you are going to handle your shipping and set your shipping rates. Use this link to read about shipping settings in Woo Commerce. For Detailed information see Adding and Managing Products at the Woo Commerce site. Just like adding page or posts titles, type the name of your product as you would like it to appear under the thumbnail on the main shop page and at the top of the product details page. 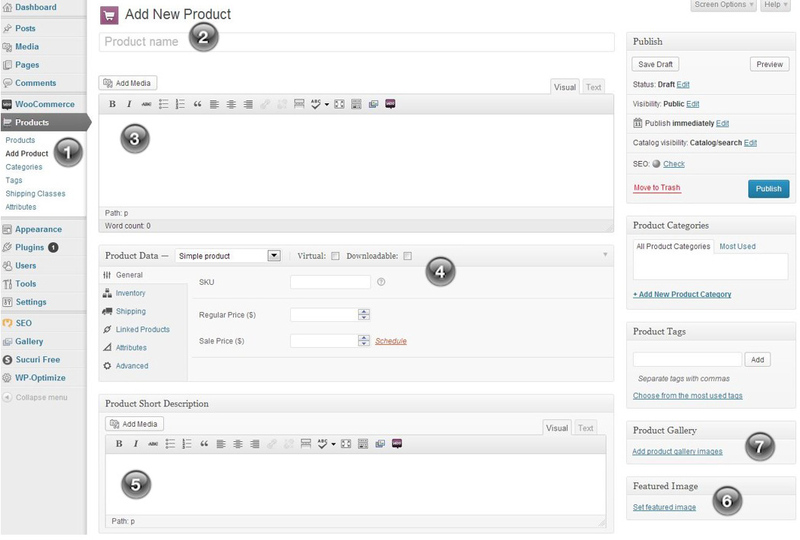 In the main editor add any text, images, links you would like to appear under the Product description tab. The content here is added exactly the same as it would be for any other page or post. It can be as long or short as you need it to be. If you don’t add any content the Description Tab will not show on the live site. It is not mandatory to add content here but if you do it may help sell your work. People like stories. If you are selling original work and not multiples fill in the General task pane. If you carry inventory then you will want to add that information on the Inventory tab. Please see https://docs.woothemes.com/document/managing-products/ for the detailed information for this area. The short description appears next to the feature image on the product page. This is a good place for the Name, size and medium of the piece. A feature image need to be uploaded to the media library in order to attach images to the product. These images need to be in the media library for Woo Commerce to find them. DO NOT use images from NextGen Gallery. 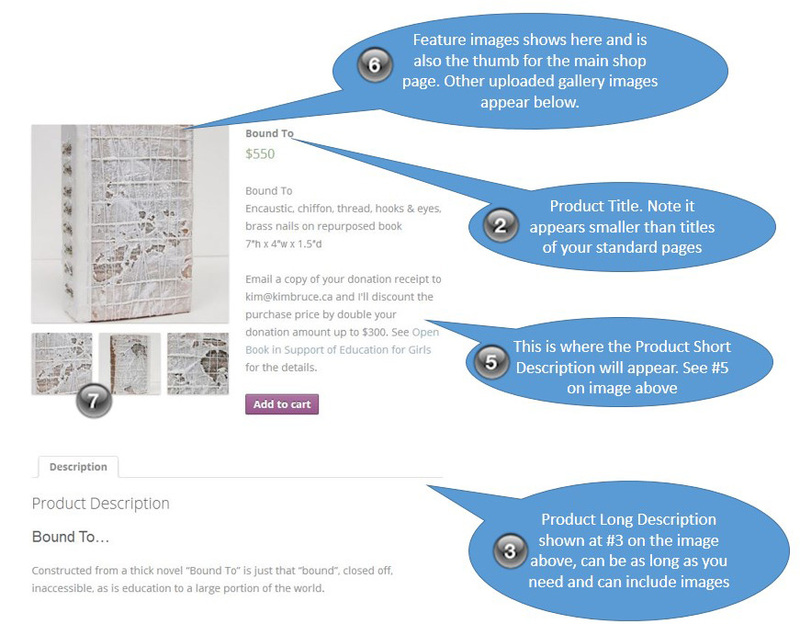 Add additional images that will appear as thumbnails under the feature image on the product detail page. When click on the live site they will open in a lightbox and your customers can navigate all the product images from there. How to set up product variables. Use this if you have, for example, different print sizes and need to set up the sizes for people to chose from.